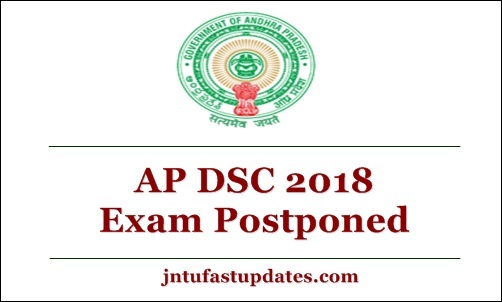 AP DSC Revised Exam Dates 2018: The Andhra Pradesh District Selection Committee (AP DSC) has released the revised schedule of the exam on Wednesday evening after it announced the deferral of exam for two weeks. The Andhra Pradesh District Selection Commission (AP DSC) has declared that the AP DSC examination has postponed to 2 weeks. AP State Education Minister Ganta Srinivasarao has expressed to media about the postponement of the AP DSC examination. As the time gap between the notification date and examination date is very less, the applicants have requested to postpone the DSC examination. As per the request of applicants, the teacher’s recruitment test (TRT) has been postponed to a later date. Today, Ganta Srinivasarao has announced the AP DSC rescheduled exam dates at apdsc.apcfss.in. Applicants who wish to check the updates regarding the AP DSC Rescheduled dates can keep visiting the official portal, apdsc.apcfss.in. The website will soon post the updates regarding the new dates of the examination. According to the new schedule, the exams will begin from December 24 and end on January 30 with SGT exam. Candidates can download the hall ticket from December 10. For school assistant (non-language) candidates, the exam will be held on December 24, 26 and 27, school assistant (languages), the exam is on December 28. For TGT, it is on December 30 and January 1 and for PGT the exam is on December 29. For more details please check Revised TRT and TETcumTRT Schedule as given below. అమరావతి, డిసెంబరు 17(ఆంధ్రజ్యోతి): డీఎస్సీ-2018కి సంబంధించి కొంతమంది అభ్యర్థులు 4, 5 వేర్వేరు సబ్జెక్టులకు దరఖాస్తు చేశారని, దీంతో వారు అన్ని సబ్జెక్టులూ రాసేలా షెడ్యూల్‌లో చిన్నచిన్న సవరణలు చేసి తేదీవారీ పరీక్షల షెడ్యూల్‌ను వెబ్‌సైట్లో పొందుపరిచామని పాఠశాల విద్యా కమిషనర్‌ కె.సంధ్యారాణి తెలిపారు. ఇందులో స్కూల్‌ అసిస్టెంట్‌ లాంగ్వేజెస్‌ పరీక్షలో కొన్ని సబ్జెక్టులు 28వ తేదీకి బదులు 27 మధ్యాహ్నానికి ఒక సెషన్‌ ముందుకు తీసుకువచ్చామని పేర్కొన్నారు. పీఈటీ సబ్జెక్టులు 29వ తేదీ ఉండగా తెలుగు, ఇంగ్లిషు సబ్జెక్టులను ఒక సెషన్‌ ముందుకు అనగా 28 మధ్యాహ్నానికి తీసుకొచ్చామని వివరించారు. 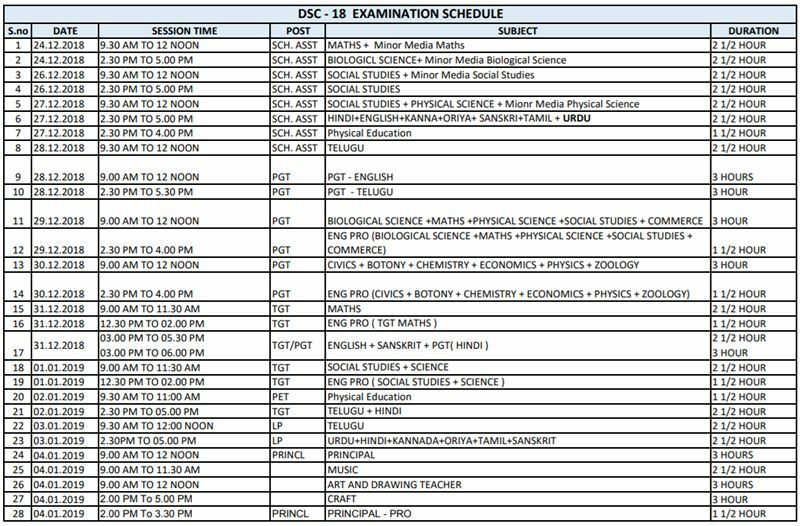 As the CSE has postponed the DSC exam, the examination center options will also be likely to change. Applicants can observe the examination center details from their respective hall tickets. The CSE is also observing the demands of applicants to extend the number of posts. Soon, the department will announce the information regarding the expansion of the number of posts. Can I change exam date sir. At the same date rpf exam .so please sir exam date is changed please……….